At first I was a little worried, because some of the phrasing is a little awkward so it would jerk me out of the story when I would have to reread a sentence two or more times to figure out what was going on. After enough times, I guess my brain finally caught on that the sentences weren't necessarily fragments, but just referencing the sentence or two before. In the Air Tonight is also told in alternating points of view, with Raye's parts in first person and everyone else's in third. It was an odd mix that also took some adjustment time. So, the beginning was a little rough for me, but it smoothed out and the story flowed nicely except for a few small parts. There was an unequal distribution of information given to the reader, but the scenes of info-dumping actually made sense to the story, so it wasn't that bad. I really liked the mystery aspect of hunting down the serial killer and trying to figure out his motivation. I had a ton of possible scenarios, but didn't actually guess what was going on with the actual murderer. Also, it was obvious that the history in In the Air Tonight was very well-researched. Handeland skillfully mixed the facts and fiction to create a mostly believable paranormal tale of witches, witch hunters, ghosts and secret societies. My one big issue is a lack of believability about some parts. Bobby just didn't act like a cop to me, and being from Louisiana, I can't see a NOLA detective getting over a week to cover some halfway flimsy lead on a case that no one believed in. There's also some insta-love between Bobby and Raye. With their story wrapping up in one book, I guess it was kind of necessary, but I think that having their relationship progress over several novels would have been more natural. I enjoyed In the Air Tonight, even though it had a few flaws, and immediately requested the next two novels in the trilogy. 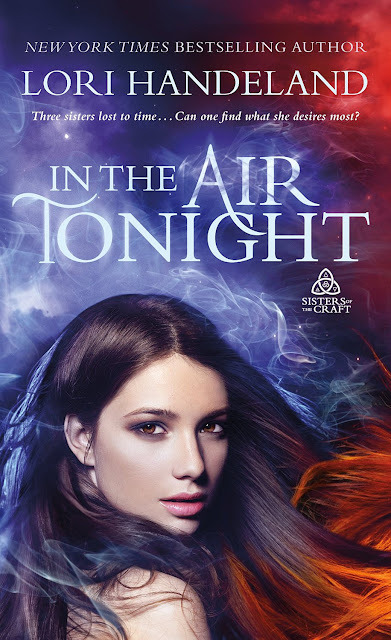 If you're like me and love witchy stories, especially the paranormal romance version, you should definitely pick up In the Air Tonight.